Curvature analysis of progressive dip trends. Assessment of structural style to characterise gravity transport deposits. Identification and interpretation of fracture sets by character and orientation. Generation of fracture frequency and spacing data along the wellbore and correction to mitigate borehole sampling bias. Presentation of fracture frequency curves by constant interval, structural zone and supplied unit. Fault kinematic analysis, including modelling of drag geometry to estimate sense of offset and minimum throw, and the description of damage zones. Presentation of structural cross-sections through transverse sections. 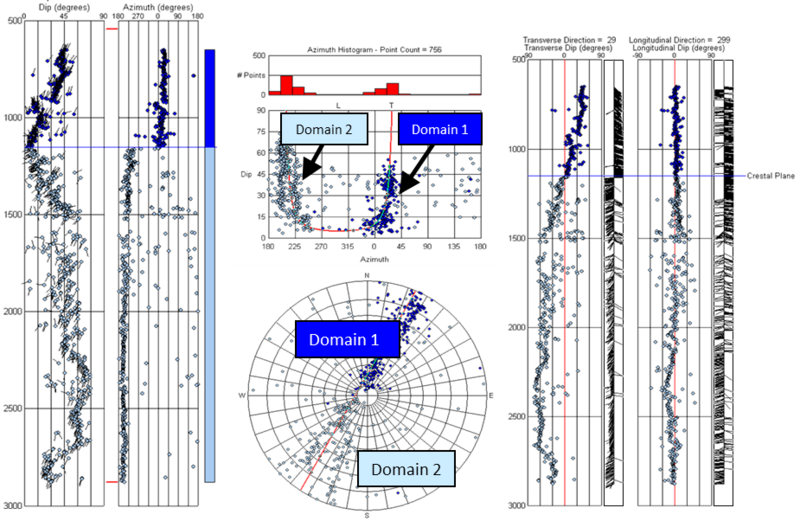 Interpretation of present-day in-situ stress indicators such as borehole breakout, drilling-induced tension fractures, oriented calipers and acoustic transit time to assess the orientation of the present-day stress field at the wellbore.